Orange County is served by an excellent transportation network of major U.S. and state highways that provide safe, convenient and immediate access to points all around. U.S. Routes 15 and 522 and State Primary Route 3 provide access to points north and south, while U.S. Route 33 and State Primary Route 20 provide access to points east and west. Interstates 95, 66, 64 and 81 are all within 55 miles of the county. 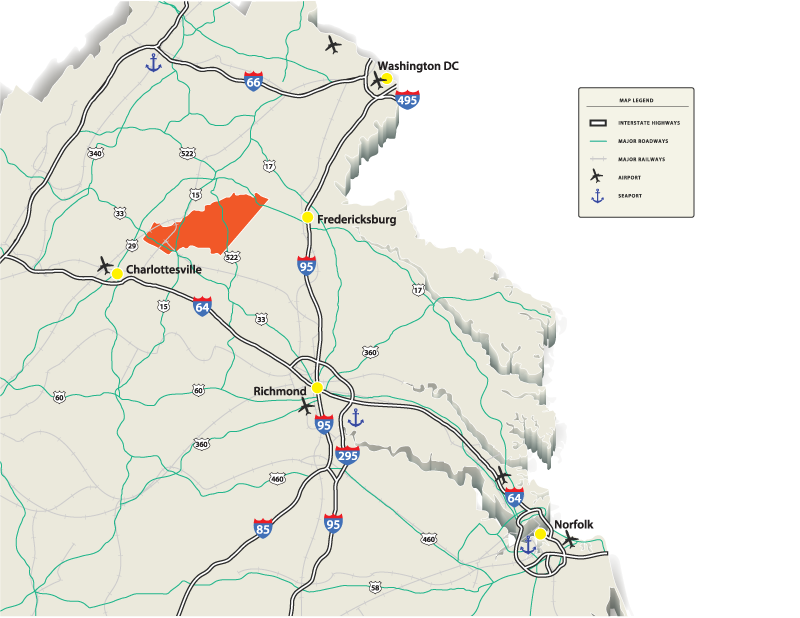 The length Orange County is traversed by State Primary Route 20, connecting Wilderness to Charlottesville, and is bisected by U.S. Route 522, connecting Culpeper and Lake Anna. Access to the major cities of Washington, DC, Richmond, and Norfolk are within a few hours’ drive. For national and international travel, five airports are within reasonable commuting distances of Orange County. Locally, Orange County Airport (OMH) has a runway length of 3,200 feet with a parallel taxiway, an Automated Weather Observation System (AWOS), 24-hour self-service fuel (Jet-A and AVGAS), instrument approaches and a new, state-of-the-art airport terminal with 24-hour pilot access. Skydive Orange is one of the oldest club-operated drop zones in the country and operates out of Orange Airport. Gordonsville Municipal Airport (GVE) is a fixed-base operator with full services, 2,300-foot runway, and published instrument approach. Both offer tie-downs and hangars; rental and charter planes available. Norfolk-Southern Corporation and CSX Transportation provide regional freight service. Buckingham Branch Railroad owns a short-line rail with a junction in the Town or Orange that runs south to Gordonsville. Passenger service is provided by Amtrak with stops in nearby Culpeper, Fredericksburg and Charlottesville. The Port of Virginia is the third-largest port on the East Coast and has the deepest channels on the East Coast; it is within three hours via Interstate 64 and distributes one-third of its cargo by rail. Numerous other marine and inland ports are accessible within short distances. The Port of Richmond is Central Virginia’s domestic and international multi-modal freight and distribution gateway on the James River, located within 90 minutes via Interstate 64.